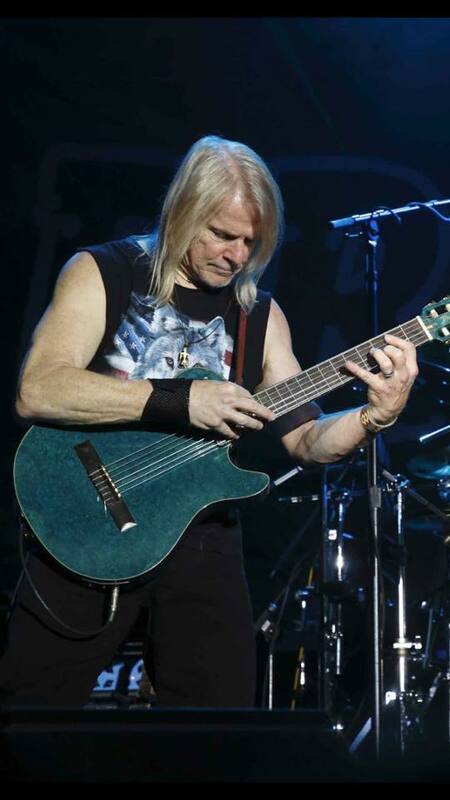 Deep Purple rocker Steve Morse is asking for the public's help in tracking down a rare guitar of his that was stolen last week during a Dixie Dregs tour stop in Washington, DC. The one-of-a-kind, custom built, handmade Buscarino electric acoustic guitar (pictured above) went missing on March 7 at the city’s Lincoln Theatre. "Ok all Dregs fans and Steve Morse fans, he needs your help,” reads the statement on Morse’s social media sites. “Steve's Buscarino electric acoustic guitar was stolen in DC during load in. We need help keeping a look out for it. Police have been called and are actively watching video footage. But there is a reward with no question asked, if returned." Longtime friend and renowned rocker Steve Vai has also spread the word about Morse’s situation, writing, “One of the hardest things a guitarist may have to face is when one of their vital guitars gets stolen. Unfortunately that’s the case with our great Steve Morse. Morse is currently playing shows on the "Dawn Of The Dregs" tour, which features the original lineup behind the 1977 album "Free Fall": Morse, keyboardist/saxophonist Steve Davidowski, bassist Andy West, drummer Rod Morgenstein and violinist Allen Sloan. The US trek – which kicked off in Clearwater, FL on February 28 – runs until late April before Morse regroups with Deep Purple for a summer tour that will begin at Mexico City’s Hell & Heaven Fest on May 4.